A few days ago, we picked the last of the cumbers from our garden and started to ferment this batch of kosher dill pickles. We lost our vines to cucumber beetles and so we’ve pulled them up and transplanted some of our late season cabbages into that bed. 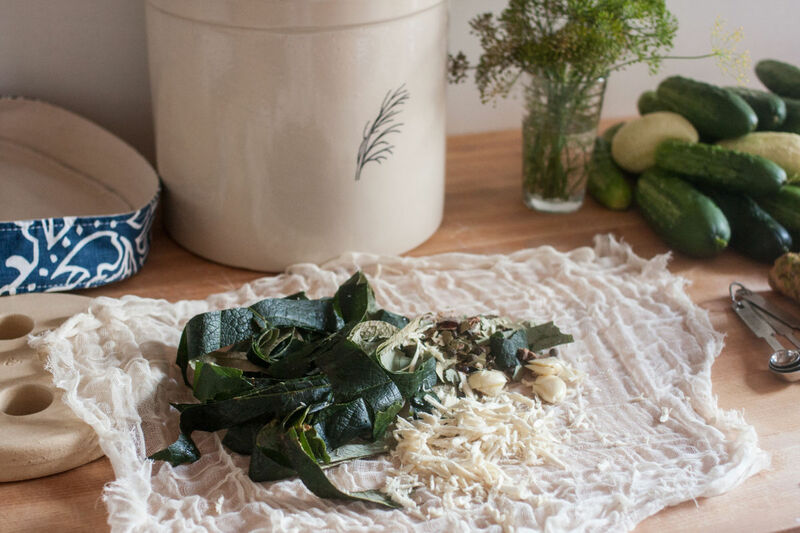 Like fermentation, gardening is a process where you keeping trying and learning and getting better – last year we got one cucumber, this year, we got several pounds, and next year, we’re aiming for even more. Scrubbed and brushed the cucumbers under running water. Scraped the blossom ends off with a paring knife. 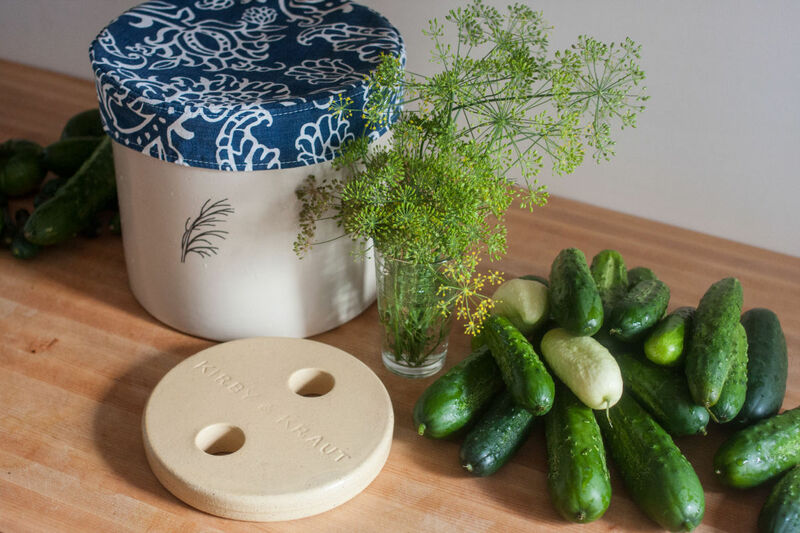 Placed the crock on it’s side and packed the cucumbers, vine ends up, into the crock. Around half-way through, tucked in the cheese cloth bundle of spices and continued packing the crock until it was tight. Added the weight and enough 5% brine to cover the weight by one inch. 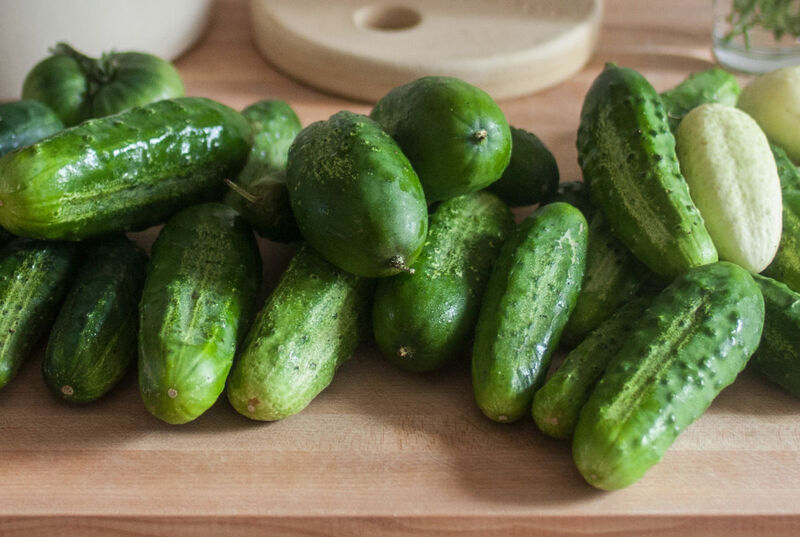 We planted about six varieties and they grew in all sorts of shapes, sizes, and colors – the lighter cucumbers are “White Wonders”. Putting together the cheesecloth spice packet. This helps keep the brine neat and makes it much easier to skim the crock.